Download the presentation on "Defining a SOA Roadmap based on a Maturity Model"
Understanding the SOA maturity level of your organization. Defining a roadmap for the evolution of SOA to the next level. 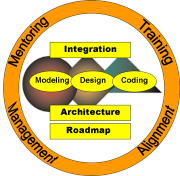 Employing the right governance to the implementation of your SOA Roadmap. The maturity of an IT organization in terms of SOA obviously doesn’t just happen over night; it is rather the product of a transformation that should be guided by a SOA Roadmap. The goal of a SOA Roadmap is to optimize the implementation of service based applications across current and planned projects and to guide the evolution of an IT organization through the stages of increasing SOA Maturity. The capability to reuse existing services. Efficient use of service intermediation. The comprehensiveness of enterprise wide security measures. The efficiency that comes with improving governance. Maintaining SLAs through operational control. Balancing adherence to standards with performance and scalability. Improved flexibility of business process implementation. Using the right SOA technology at the right time.